I'm afraid I haven't got anywhere yet with my promised Scotland photos or Steadepod review, but I have updated the site so you can now view photos in date order. This allows you to view photos in order of the date they were added to the site, maybe later I will also add an option to allow viewing in order of date taken. I have also added some more photos taken in the last couple of months. This one I took just a couple of days ago, of the Christmas tree in the town centre. Unfortunately it was a bit windy, which has blurred the tree branches somewhat. Still, it would have been a total blur if I'd taken it a day earlier when we had gales. 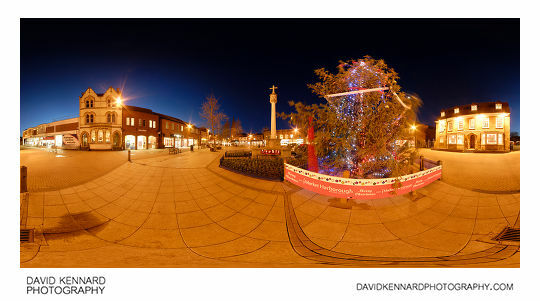 You can also see this image on my panorama website: Christmas Tree in The Square, Market Harborough 360 VR, it is the first panorama / photo I've ever recorded sound for. I hope to do more sound recordings to go with my panoramas and photos in the future, especially for ones taken out in the countryside with the birds singing. 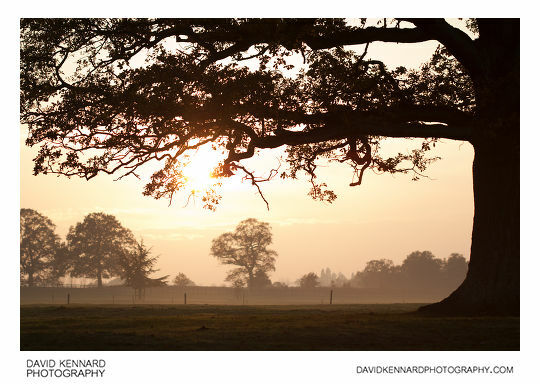 This one (above) I quite like, with the oak tree silhouetted and the nice orange sky. I took it on 19th November 2011 with the Canon 100mm macro lens. From the same afternoon, I caught this bullock emerging from a group of trees. 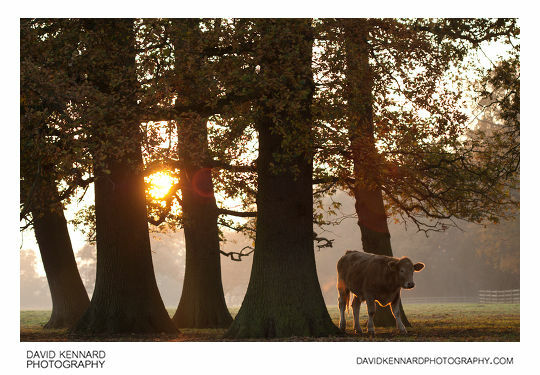 I wish I'd been a bit quicker so the bullock was just coming out from the behind the large tree. Also, I had a wonky horizon and had to straighten this on the computer, which has made the bottoms of the trees a bit close to the bottom of the frame for my liking. It also has some lens flare, but I don't it detracts from the image that much. Despite its flaws I quite like this photo, but it is important to always be critical and think What could I do better next time? This is probably the same Bullock, focus is off a bit, though not too bad. I like the back-lighting on the bullock's body though. 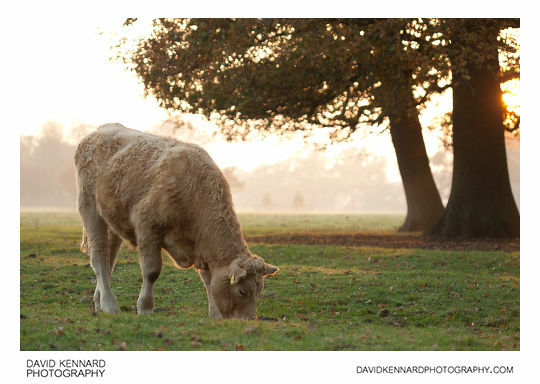 As I walked back after photographing the cattle, a low mist started to fill this field, so I took a panorama there. 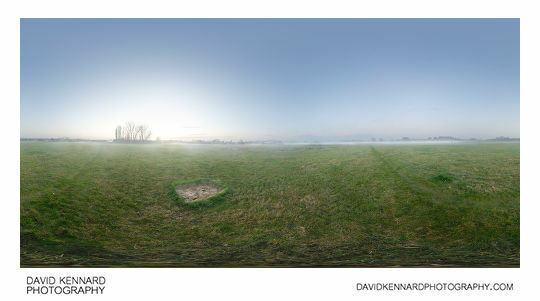 You can see the interactive version here: Grassy field and autumn mist 360 VR. It was quite strange because the mist was only in part of the field, and you could see over the top of it and underneath it. It was floating about 1 foot above the ground and was about 3-4 feet high. So what do I have planned for the coming year? Well, I still have a lot of old photos to process, I am hoping to at least get some of the Scotland and Japan photos done and up on the website. I will probably be focusing on panoramas though. In the Springtime I hope to do some more macro photography. And later in the year I am planning on visiting the Ukraine (including Chernobyl / Pripyat), Transnistria, and Moldova. I have also been looking at the various camera options currently available from manufacturers, and am leaning towards something like the Panasonic G3. Small and light with small lenses, so good for carrying around on holiday and hopefully also not standing out or looking overly rich to the Transnistrian border control guards. It would be nice also if I could keep this blog updated more often, but events always seem to conspire against me and drain all my time, and I expect this trend to continue into 2012. May 2012 be a photo filled and photography skills improving year for us all!